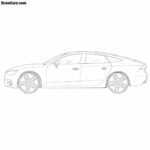 Team of artists of DrawCarz love coupe cars very much, and our readers love this type of cars too. 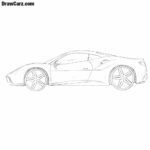 Many times many our readers asked us to make a tutorial about a coupe car, and the lesson on how to draw a coupe car easy already on drawcarz.com. First, we draw the outlines of our coupe car with the help of a long and flat rectangle and a trapezoid figure. The outlines in this step should be made using very light lines. Now we need to add the most basic parts to the body of our coupe. Outline the headlights, windows, mirrors and wheels. This step is also performed using very light lines. In this step, we need to be more attentive. Gently circle the outline of the headlight and the long hood of our coupe car. Since we are drawng the car from the side, we see only one headlamp, this greatly facilitates our task. Let’s now go to the roof of our coupe. This type of cars by the way differs from the others with a rather low roof, which we should depict in this step. So with the help of dark lines, carefully circle the top of the car. Another distinctive feature of coupe cars is that they have only two doors. In this step, we just need to draw this very door and the outlines of the side of the body. Do not forget to draw a turn signal lamp, handle and molding. 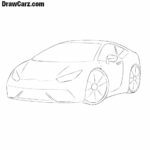 This step of the lesson on how to draw a coupe car will be fairly simple. Here we will need to draw the trunk and taillights. By the way, when drawing a coupe, do not forget that it should have a rather sloping rear part. Now, with very careful hand movements, draw out the wheels of our coupe. By the way, this type of car body is also often equipped with fairly large wheels with low profile tires. 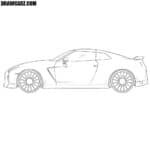 The last step of the lesson on how to draw a coupe car easy will be devoted to the fact that we will draw the rims. 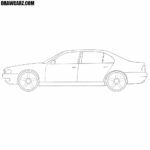 To make the car more aggressive and cool, draw big rims, as did the artists of DrawCarz.com. This is the first lesson that the artists of DrawCarz created according to your requests. 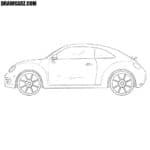 As you can see, we are very attentive to your wishes, so write us what kind of cars you would like to learn to draw.